The National Bank of Ukraine (NBU) and the SBU security service have been told to draft proposals for sanctions against banks with stakes in Russian state banks, according to the head of the National Security and Defense Council, Alexander Turchinov. “The National Bank of Ukraine, the Security Service of Ukraine are instructed to analyze activities of Ukrainian banking institutions with Russian state banks' shares in funds, and to submit the relevant proposals, including on imposing sanctions on them, by the end of the day,” Turchinov said following Wednesday's meeting of the Council. Several subsidiaries of Russian banks, including Sberbank, VTB, and Prominvestbank, are currently providing banking services in Ukraine. Apart from state-run banking institutions, there are also units of private Russian Standard Bank and Luxembourg ABH Holdings owned by Russia’s Alfa Bank. The Ukrainian subsidiary of Sberbank has had to reduce cash withdrawal limits at the bank and ATMs, saying this was necessary due to pressure being put on the bank. 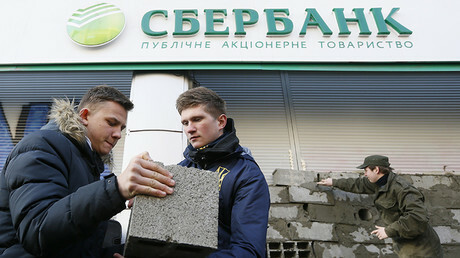 On Monday, Ukrainian radicals bricked in the entrance and windows of Sberbank’s head office in Kiev with concrete blocks. 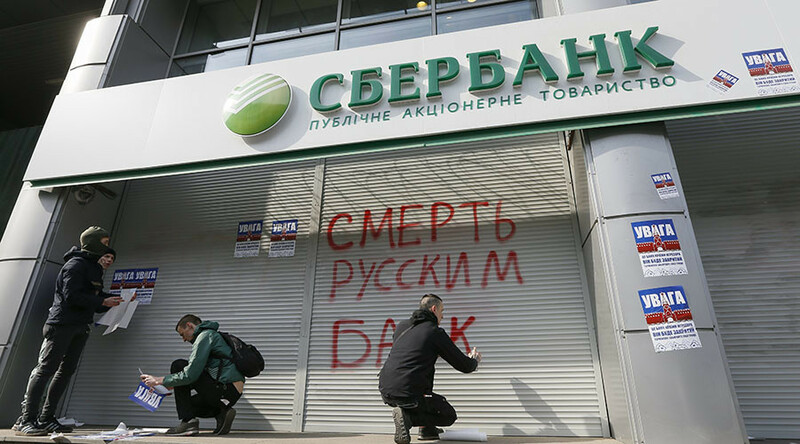 The situation worsened with more acts of vandalism against the Russian banks' subsidiaries the following day. “Due to the unlawful actions of third parties blocking the head office and physical harm done to the bank's bank machines, which has led to the disruption of cash deliveries to branches/bank machines, we announce the imposition of temporary limits on cash withdrawals from the current accounts of individuals through the bank's cash department in the amount of 30,000 hryvnia ($1,120) per day per client as of March 15, 2017,” the bank said in a statement. Kiev had previously accused Sberbank’s Ukrainian branch of providing services to passport holders of the self-proclaimed eastern Ukrainian regions of Donetsk and Lugansk. The lender has denied the claims. Russian Foreign Minister Sergey Lavrov urged Ukraine’s authorities to protect Sberbank’s branches without political considerations. Kremlin spokesman Dmitry Peskov said Moscow was watching the situation closely. As a result of potential sanctions, regular customers may lose access to banking services provided by Sberbank. The bank operates 150 branches all over Ukraine, has millions of clients along with 37,000 corporate customers. Last July, Sberbank was 7th among the country’s 108 banks by assets, according to the NBU.